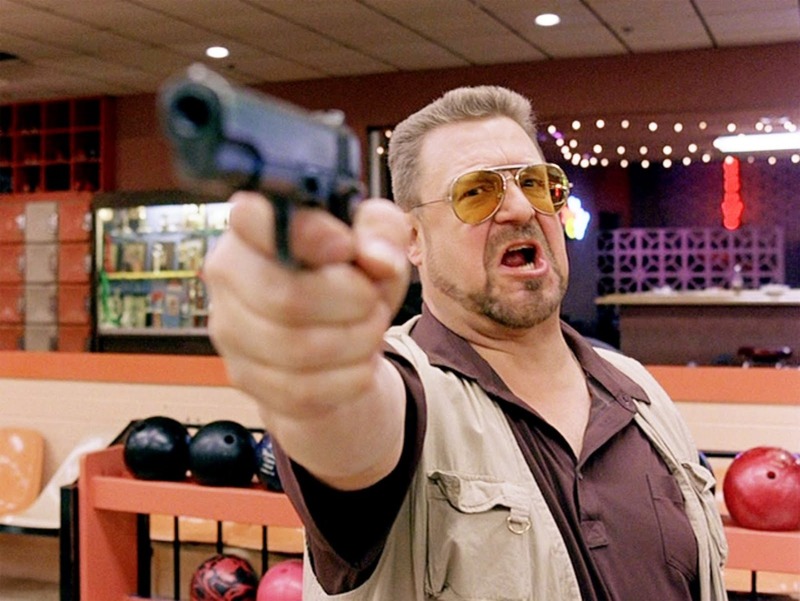 John Goodman. The only one who cares about the rules. And take a look at some other actor portraits that I’ve done ! If i am to comment on the portrait above, there are some points worth mentioning. The hand/gun/face being slightly out of proportion perspective-wise, the head being a little too round, and the hair disappearing behind the cloud of purple.. I have plenty of excuses! First of all, it’s saturday, yesterday was my night-shift, i am tired.. And..
And the hand seems strange too, doesn’t it?.. It was blurred in the photo, and i am a slave to references..
Love this scene, great portrait of a great actor. Love it. The Big Lebowski is not to be missed. Very nicely done. “Mark is zero!” Great likeness of everyone’s favorite lovable psychotic.